My father was the youngest of seven children. The nearest sibling to him in age was eight years older. The oldest sibling was a whole 20 years older than him. Grandad, and Dad's two oldest brothers and his sister all served in the Second World War. All in the Royal Navy. Like many families, our family lost someone in the War. My Uncle George, Dad's second oldest brother, died during an enemy engagement in 1943. My Dad was a toddler at the time. We'd always been told that Uncle George was buried in Hull, and as a consequence, my father had never had the opportunity to visit his grave. A chance Google search, led me to an entry on Flickr, and we discovered he was buried in Great Yarmouth - not that far from Kent where my father grew up. And in fact, I had visited Great Yarmouth myself a couple of times. 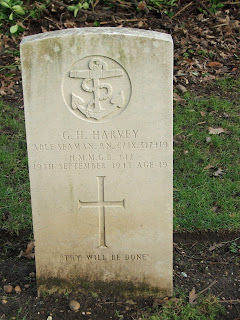 Son of Hedley and Edith Mary Harvey, of Sheerness, Kent. For many years Great Yarmouth was a naval base, containing a Royal Naval Hospital and there are three naval plots in the burial ground at Great Yarmouth (Caister) Cemetery which contains war graves of both World Wars, as well as other Naval graves dating from 1906 onwards. Some of the 1914-1918 graves are in groups to the west of the entrance, while others are scattered. After the 1914-1918 War, a Cross of Sacrifice was erected near the mortuary chapel. During the early months of the 1939-1945 War, ground in plot M in the eastern part of the cemetery, north-east of the mortuary chapel, was set aside for service war graves, and this is now the War Graves Plot. 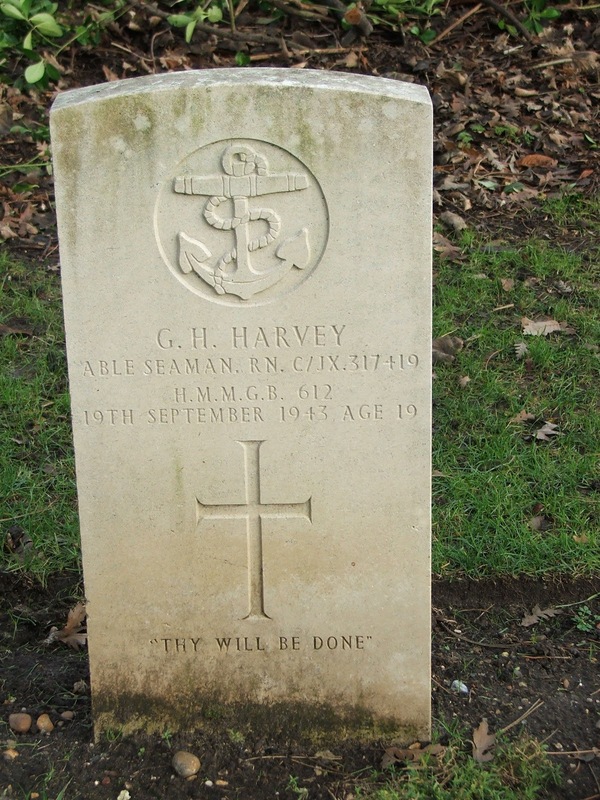 It was used for Army, Air Force, Merchant Navy and Allied casualties, and the Naval plot A was used for Royal Naval casualties and for some of the Merchant Navy men; but there are a number of scattered war graves in the cemetery. There are now 168 Commonwealth burials of the 1914-1918 war and 115 of the 1939-1945 war commemorated in this site. Of these, 13 from the 1939-1945 War are unidentified. There are also 3 Foreign National war burials there. (Special thanks to UK taphopile "Claire" from Flickr, and the Commonwealth War Graves Commission). According to Leonard Reynolds book “Dog Boats at War” (ISBN 0 7509 1817 9) MGB 612 was hit during a surface action with M class German vessels (not aircraft). On the night of 19th/20th September 1943 an offensive unit of 6 “D” boats made up from the 17th and 31st Flotilla’s led by Lt Bradford RNR, Senior Officer of the 31st aboard MTB 617 (MTB 624 had returned to base - HMS Bee Yarmouth with engine problems) leaving the unit as - MTBs 617, 621, 652from the 31st Flotilla, with MGBs 606, 612 and 610 of the 17th Flotilla . MGB 612’s Commanding Officer was Lt P Wilkinson RNVR.